We have always been a meat-and-potato family. When I think about dinners at my grandparent’s home in Idaho, hearty meals with meat, potatoes, garden-grown veggies, maybe a salad and something sweet for dessert around a big, crowded table are the memories I recall. The almost-too-warm kitchen flooding the dining area with heat from the oven and stove. The close quarters as everyone squeezes in around the table expanded with as many leaves as it will hold make passing the food a little difficult at times, but no one complains. The good food and family time are all worth it. 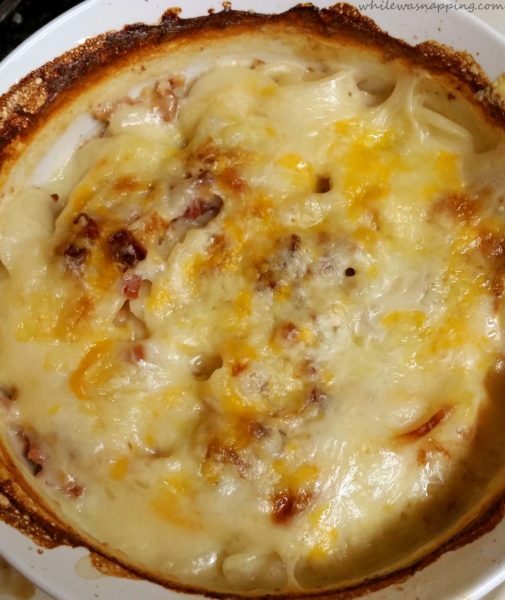 One of my favorite dishes is my grandma’s Scalloped Potato Bacon Casserole. She always made hers with fresh potatoes, homemade sauce and chunks of leftover ham, but I don’t know how she found the time to do all that. And that’s where I look to Betty Crocker to help me out. Betty Crocker’s Scalloped Potatoes are wonderful for this recipe and cut down on the preparation time immensely. And I have the option to throw it all in the slow cooker and just let it cook. This is especially nice when I’m preparing lots of other dishes for the same meal. I’ve created a few short cuts to fit this childhood favorite in with my family’s crazy schedules and kept this traditional dish alive and thriving in our family. 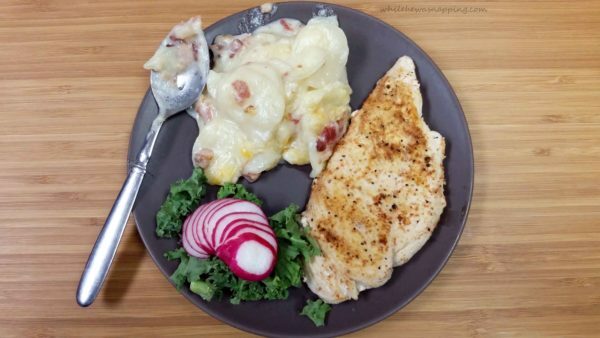 Scalloped Potatoes and Ham Casserole that makes a great side dish or a light meal all on its own. Simple and delicious, a family favorite! Preheat oven as directed on the package of Betty Crocker Potatoes. Mix up the sauce as directed on the package of Betty Crocker's Scalloped Potatoes in a large oven-safe casserole dish. Layer half the potato slices in the sauce on the bottom of the casserole dish. Sprinkle in half of the ham dices or bacon bits. Sprinkle in half the cheese. Repeat the layers - Potato slices, ham or bacon pieces and top with cheese. Garnish with green onions, if desired. Bake as directed on the scalloped potatoes package. CAUTION: POTATOES WILL BE HOT! This is a regular dish for all our family holiday dinners, but it makes an appearance on regular old weeknights at our house too. Grandma makes it all from scratch and it always disappears faster than I wish it would. But I don’t get as disappointed as I used to when I was younger, knowing it was going to be a while before I got to eat it again. But this recipe works well and satisfies my longing for Grandma’s Scalloped Potatoes & Ham Casserole. My kids love this recipe and will almost always go back for seconds (we have to double the recipe most of the time). I love that I have found a way to take this favorite recipe from when I was a little girl and share it with my family now. I love that they love it too! And I love that it takes me about 10 mins to put together and is ready about the same time we are ready with the rest of dinner. Sometimes I love to sit down with the leftovers, warmed up, snuggle in with a cozy blanket and spend some quality time with my favorite TV show of the moment. Childhood indulgence and a guilty pleasure: It’s my own little piece of heaven. 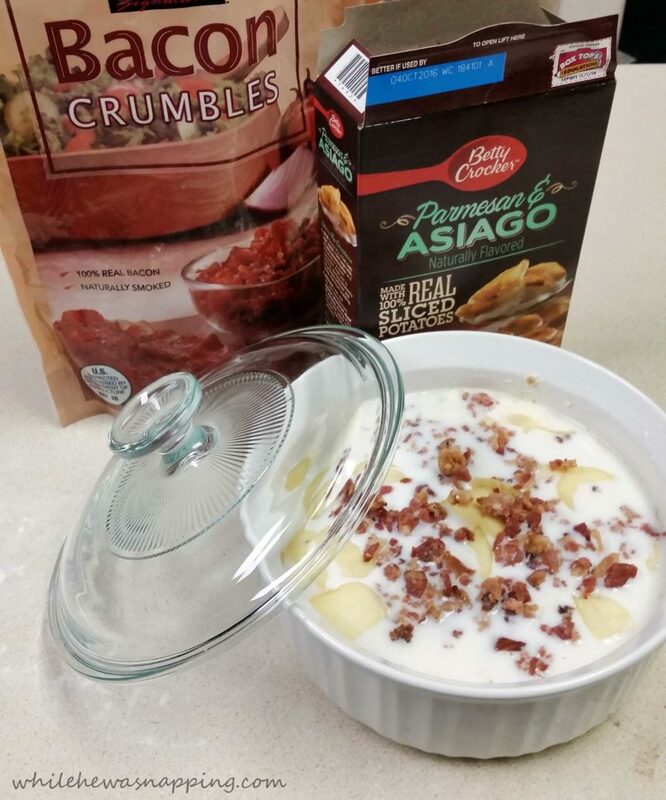 You can grab this coupon and save $0.50 on two packages of Betty Crocker Potatoes. Betty Crocker Potatoes can be used as a substitute for fresh potatoes and have a longer shelf life. They are 100% real potatoes grown in the USA. 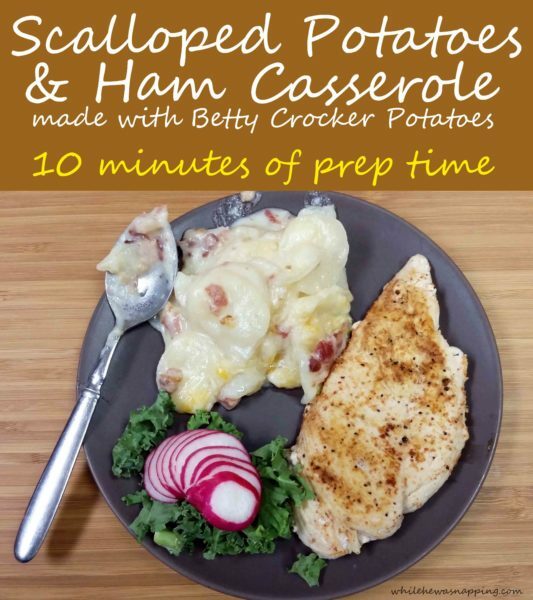 You can make so many meals with Betty Crocker Potatoes and they are much easier to get home than a heavy bag of bulky potatoes.